Graphic reads "Enjoy Climate Change" in the style of the Coke company logo. Text below reads "Coca-Cola's use of HFCs to cool its drinks contributes to climate change. Ban HFCs." 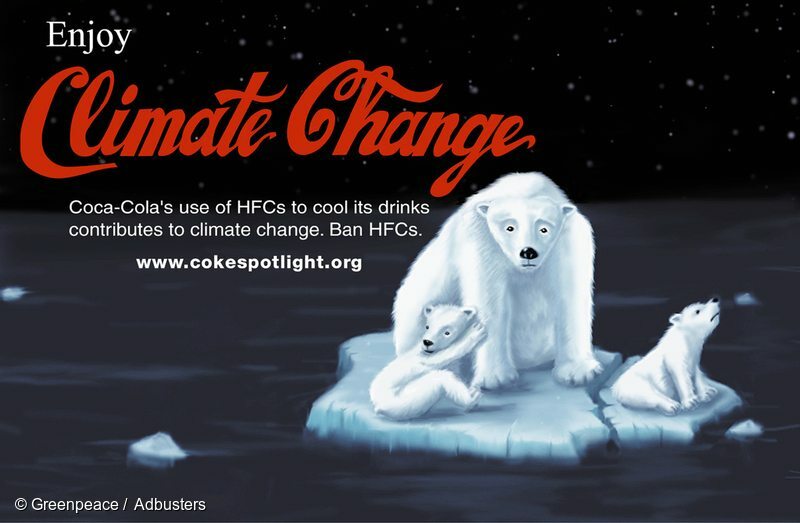 This graphic was used on the Cokespotlight.org website in 2000 for a campaign ran by Greenpeace along with Adbusters. The campaign called for Coke to not use HFC refrigeration at the Sydney Olympics. This was one of Greenpeace's first online campaigns and led to a committment from Coke to phase out HFC, and adopt Greenfreeze technology. F-gases are one of the fastest growing contributors to climate change. They are mostly used in refrigerators or air conditioning. The problem comes when f-gases escape, either through leaks, during maintenance, or when an appliance is scrapped at the end of its life. Greenpeace has a history of campaigning against f-gases. Overall, fluorinated gas emissions in the United States have increased by about 73 percent between 1990 and 2013. 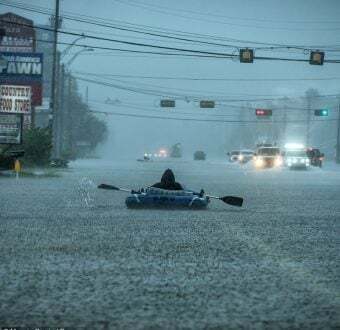 This increase has been driven by a 250 percent increase in emissions of hydrofluorocarbons (HFCs) since 1990. These HFC molecules heat the planet even more than the average carbon dioxide molecule. Our first big success on natural refrigerants came in 1992, when Greenpeace developed an alternative refrigerator that did not use the extremely potent greenhouse gases HFCs and HCFCs. Greenpeace obtained orders from 70,000 Germans for the non-existent refrigerator in just three weeks, which in turn encouraged a manufacturer to actually build it. 17 years later, over 300 million refrigerators utilizing this technology have been sold in Europe, Asia, and South America by leading brands including Whirlpool, Bosch, Haier, Panasonic, LG, Miele, Electrolux, and Siemens. The technology was a little slower to catch on in America, ironically because the EPA had a lot of bureaucratic red tape before hydrocarbons could be approved. Corporations Band Together for Refrigerants, Naturally! This new technology was approved in 2008, and shortly thereafter Ben n’ Jerry’s released a greenfreeze refrigerator containing chilled Chunky Monkey in venues across the country. Greenfreeze turned out to be very appealing to corporations, perhaps because it was more efficient, and therefore cheaper when compared to its climate change inducing predecessor. An unlikely alliance of major corporations formed between companies like Coca-Cola, Pepsi, Unilvever, and Red Bull. They shared open-source notes with one another on how Greenfreeze could be further improved. The initiative was called Refrigerants, Naturally! and was supported by Greenpeace and the United Nations Environment Programme. Our efforts, along with help from Greenpeace supporters across the globe, meant that f-gases were included in both the Montreal and Kyoto Protocols. This effort was built upon by the success of Greenfreeze, and now Coca-Cola Company has committed to get all HFCs out of its distribution by 2015, with other companies following suit. The combined efforts of Greenpeace, supporters around the world, and (refreshingly) corporations, has helped to fight climate change by reducing f-gases. Greenfreeze technology has shown that investing in efficient, sustainable tech is worthwhile. The consumers buying ice cream and chilled beverages from more than 300,000 HFC-less fridges around the world would probably agree.